The need to speed up patch deployment across today's highly complex and distributed IT environment has never been more important. The heat is on to proactively safeguard your systems and endpoints from the newest exploits as the time it takes hackers to exploit a known vulnerability continues to shrink. Using patch and vulnerability management as the principal component of your risk mitigation strategy and taking prudent measures to establish a best practices approach can help reduce costs and risks in the long term. 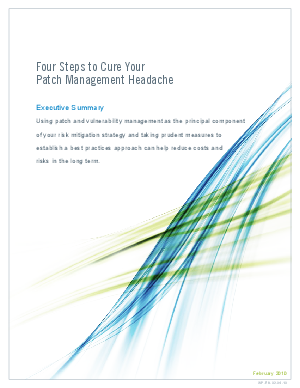 This paper highlights the four steps organizations should take to automate and streamline the patch management process.